We intend to open a new field station in Turkey next year, covering Turkey and the Arab world (in particular Syria). We are in the midst of negotiations with Ankara Univ. and Marmara Univ. 21 COE Project sent two of our graduate students to Cairo. YOKOTA Takayuki(Year of enrollment: 2000), a specialist on the grassroots movement of Islamism, and ARAI Kazuhiro(Year of enrollment: 2001), a specialist on contemporary Egyptian tariqas, were sent for this project. They are carrying out their research in Egypt. We held a research meeting on the Egyptian dialect of Arabic and classical Arabic texts. I also provided several tutorials to them during my stay. I had the chance to talk about international cooperation with staff from several universities, i.e., Ankara Univ., Marmara Univ., Uludag Univ., Chanakkale Univ. 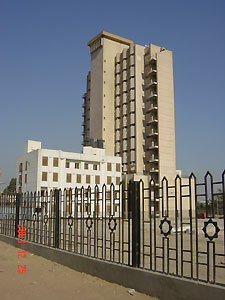 in Turkey and Cairo American University in Egypt. I am building an academic partnership with Prof. Mahmut Erol Kilic of Marmara Univ. and Prof. Mark Sedgwick of Cairo American University; they will be invited to Japan to participate in the international workshop titled “Changing Knowledge and Authority in Islam” organized by the Japan Association for Middle East Studies. I also received compliments on the level of Islamic studies in Japan from Prof. Bulent Senay of Uludag University, and had a talk on international cooperation. We are maintaining a good partnership with the Center for Asian Studies, Faculty of Economics and Political Science, Cairo University. The aim of this visit included both philological research and fieldwork. In Turkey I carried out philological research at the Center for the Islamic Research, and did fieldwork in Muhyiddin Cami and Uzbekler Tekkesi. The Egypt National Library, Azhar Library and Institute of Arabic Manuscript of Arab League were sites for the former type, and the houses of the members of Tijani and Shadhili Tariqas for the latter type of research. We have already decided to enlarge our field station from the Cairo Field Station to West Asian Field Station: based on the experiences of the past two years in Egypt, we feel that we can expand it to the Arab, Turkish and Iranian world as a whole. I was very impressed by the fact that researchers from Turkey and Egypt are becoming more and more interested in developments in Japanese research. We have already established human networks in Turkey, Egypt and Lebanon. The brand-new West Asian Field Station should be a place where we can construct a system of cooperation with Iran and other Arab countries than Egypt and Lebanon. 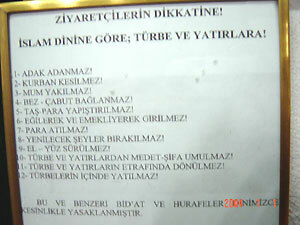 Direction on ziyara posted at the wall of Muhyiddin Mosque in Turkey. This direction near the tomb of Shaykh Muhyiddin shows us that several customs are prohibited as bid'a (deviation from Islam) and superstition. Vowing and lightening the candles are some of them.